Products | Keystone Information Systems, Inc. Since its earliest days, Keystone began its focus on developing comprehensive and integrated information management systems for our present markets of K-12 public education and local government administration. The result is that a tremendous amount of thought, planning, design and ‘real life’ usage, support each application software product that Keystone markets today. Today’s product sets are comprehensive, mature, and proven in design and function. And Keystone’s approach to the steady progress of technology has been to evaluate and incorporate useful new technologies without sacrificing mature and proven business logic. Thereby ours, and our clients’ long term investments in software, process and knowledge, have proven to be a rock solid and cost effective investment. Long time clients (some of which go back with us to the first releases in the late 1970s), have been able to progress with us to new platforms and technologies over the years, without sacrificing the foundational benefits of the products’ design. Most of the current products have grown through several major releases, with core business logic being proven on multiple system platforms and through dozens of actual implementations. Keystone continues to author its software with full time, U.S. based employees, who interact with our clients in person, both individually, and through our involvement with our active users’ group associations. SKools: Product set for K-12 District Administration includes comprehensive and integrated Financial and Human Resources product sets, with sub-modules for the unique needs of public schools, especially in the Payroll and Human Resources area. LOGIC (Local Government Information Control): Product set for municipal and county government administration, includes comprehensive and integrated Financial and Human Resource product sets, with features set for the unique needs of local government administration. While the underlying source code and product version of the LOGIC and SKools Financial, Payroll and Human Resources applications are nearly identical, flag settings and parameters are used to accommodate the different uses between these types of organizations. This provides wider supportability and product continuity among Keystone's total user community. Fully integrated applications for property tax billing and collections, as well as other public service and community development applications such as business licenses, water, sewer, trash and recycling billing, planning, zoning and building inspections and permits, and code enforcement, are offered in the three states of Pennsylvania, North Carolina and Virginia. 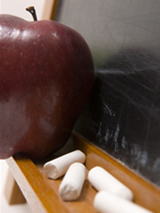 The SKools and LOGIC Financial Administration Product line, developed and supported by Keystone, forms a comprehensive, integrated suite of application software for public school and local government administration. The modules are separable in a number of areas such that an organization may grow into use of the entire suite gradually. The various modules which comprise Keystone’s Financial Management System are compliant with GAAP and GASB accounting standards and form a multi-fund budgetary accounting, and encumbrance control system, which controls budgeted expenditures, and tracks and reports all types of financial activity. All modules are closely interfaced, so as an optional module is added at a later time, the interface has already been pre-defined in the core Financials package. The general ledger is date driven and extremely flexible with regard to closing accounting periods. In addition to a tailored general ledger report writer built into the software, due to the open standard platform technology used by Keystone, (such as ODBC, SQL and XML), a variety of third party applications and tools may also be used to query Financial data, such as the Microsoft Office Suite, Crystal Reports and Entrinsik Informer. The sophisticated security features of the Financial Management System reach many levels starting with operating system security controlling who opens a session on the central application server and to which areas that user may attach. Next, there is an easily maintained menu and program security administration module. With this, a system administrator establishes which users, or defined groups of users, can or cannot access a program or even have it displayed on their individual menus. Beyond that, the Chart of Account Security can use any portion of the account number to grant a user access to a defined range of account codes. This facilitates practical, secure decentralization of data entry and inquiry, such as initial, detailed budget preparation, requisition entry, account inquiry and analysis. While the product function is deep and proven, deriving its business logic from numerous installations in medium to larger sized school districts and municipalities, and in numerous states, meeting a variety of local requirements, the products are continually enhanced to incorporate new features and state-of-the-art technology with frequent new releases, new platforms, and the development of entirely new application modules. The complete product set ties together all departments, organization-wide, eliminating duplicate databases and redundant data entry. The architecture is based on a central server for real time data integrity and up to the moment information for the decision support needs of management personnel. 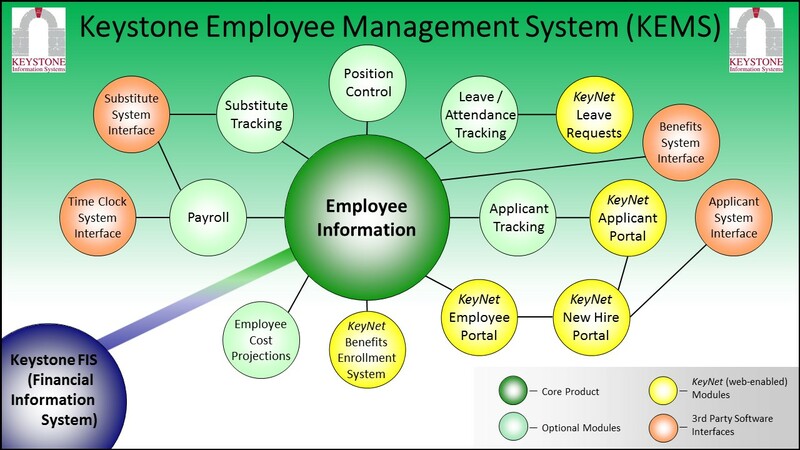 The Keystone Employee Management System (KEMS) product line, developed and supported by Keystone, forms a comprehensive, integrated suite of application software for public school and local government human resources administration. The modules are separable in a number of areas such that an organization may grow into use of the entire suite gradually. Designed through a committee process involving human resource and government finance professionals, KEMS is built upon several integrated modules that together provide a complete control over the payroll and human resource functions required for public sector personnel administration. The KEMS payroll is now meeting the state specific reporting requirements in nine states. When installed in conjunction with Keystone's SKools and LOGIC Financial Management System, KEMS interacts in an online environment, based on sound accounting principles, which provides for seamless data access across departments. Web browser-based access is provided for secured Employee Self Service, On-line Benefits Enrollment, Electronic Time Card, Leave Requests and Job Applicants. 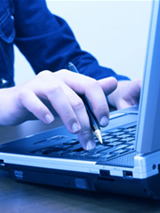 Digital images and document attachments may be linked to personnel records. Many levels of security have been designed throughout the KEMS software, so that appropriate safeguards are in place to protect sensitive personnel information. The Personnel and Payroll application modules can be installed and operated alone or together, but independently of each other if desired, with variable degrees of sharing user access and control of the employee master data file among users in either the "payroll" or "personnel" departments, as desired by the organization. When both modules are installed together, they may be linked in a variety of ways to meet any mode of operation. Due to the open standard platform technology used by Keystone, (such as ODBC, SQL and XML), a variety of third party applications and tools may also be used to query personnel data, such as the Microsoft Suite and Crystal Reports. Keystone addresses the property taxation revenue needs of local government with focus on three primary state markets, Pennsylvania, Virginia and North Carolina, using product lines specifically tailored to the unique needs of these localities. In Pennsylvania, we address the needs of municipal governments and public school districts to maintain a Census and to bill and collect for Real Estate Taxes, including sharing data with the county assessment system. Our Pennsylvania Municipal Tax product line also addresses Act 511 Taxes, Per Capita Tax, and Recycling and Sewer. The Real Estate Tax module will handle Per Capita, Census and Real Estate taxes. This module interfaces to the Keystone Financials system, posting all transactions to the General Ledger. Recycling and Sewer Fees can be included on the tax bill as one charge. Discount, face and penalty are handled along with partial payments and installments. Multiple municipalities can be handled within one taxing authority. Interim billing, delinquents, and reporting are all part of the product. Adults and students are tracked in Census with the ability to promote students all at one time. The PA Act 511 module handles Mercantile, Business License, Business Privilege, OPT, Mercantile License and EMST. Licenses are printed, tax returns are computed on screen, cash transactions are handled, and reports are generated for the township and school district. History of these taxes and payments are tracked within the system using a business identifier. For North Carolina and Virginia, Keystone addresses the tax revenue needs of both counties and municipalities using our comprehensive and fully integrated Property Assessment Administration System (PAAS) suite. When deployed to its fullest extent, PAAS addresses all of the business functions of North Carolina County Tax Administrators, Assessors and Collectors, as well as those of Virginia County and City Commissioners of the Revenue and Treasurers. Functional areas incorporated in the integrated PAAS suite include: Deeds Registry, Land Records, Mapping Integration, Real Estate Appraisal (“CAMA”), Real and Personal/Business Personal Property Billing and Collections (including Motor Vehicles and DMV interface for Virginia). Also in Virginia, PAAS addresses Animal Licensing, Business Licenses, Meals, Lodging and Cigarette taxes, and State and Estimated Income Tax filing, along with a fully centralized collections/cashiering module. The features include a split database for re-valuation, property record cards, sketching, and building images. Comprehensive account and property maintenance is available in addition to revenue collection features such as garnishment, bankruptcy, mortgage lender payments, and multiple bill payment. There are also web browser extensions for inquiry which can be set up on the organization’s web site for public access to detailed real property information, including property records cards, and jurisdiction-wide query and data download capability. A secured/real-time web payment portal is also available, providing detailed billing and history information to the taxpayer. The system is modular such that portions may be run as applicable to municipal use or for counties which require only the Appraisal or the Billing and Collections side. Interfaces to third party financial, billing and collections systems are also in place as well as interfaces for outsourced bill printing. Also for the state markets of Pennsylvania, North Carolina and Virginia, Keystone offers integrated applications for metered Water and Sewer billing, as well as Planning, Zoning, Environmental and Building Inspections and Permits, including a mobile/field inspections module.